Just like many other Italian emigrants, after Italian brothers Luigi and Francesco Vitelli arrived in the United States from their native village of Torre del Greco, they very quickly started to long for the typical food habits and culinary products of their motherland. That is why they started importing canned goods from Southern Italy as early as 1885. At the turn of the 20th century, Luigi went back to Italy, thus causing the split of the siblings’ activities with the emergence of the "Francesco Vitelli & figlio" brand on the one hand, and the "Luigi e figli" brand on the other. Then along came the brand "Luigi Vitelli" (that later became ELVEA). 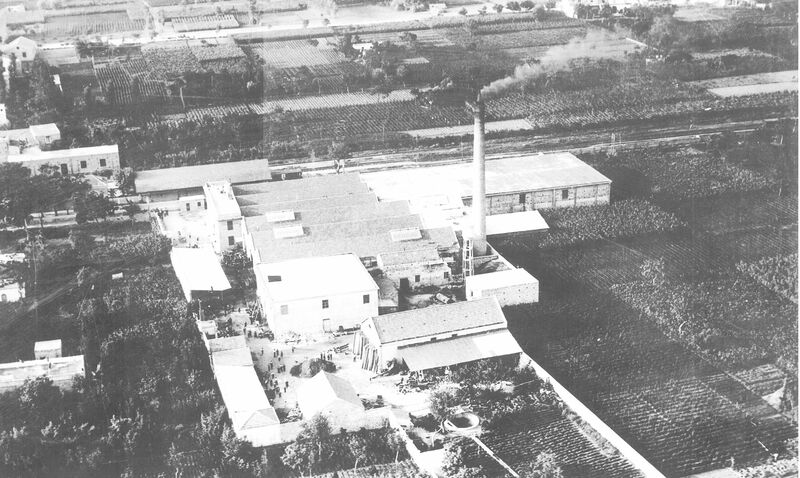 In 1919, Luigi initiated the construction of a small, but nevertheless modern, tomato processing plant close to Portici. A few years later, in 1923, the entire production was moved to an ultra-modern factory in Angri, specialized in canning 'San Marzano' tomatoes. Almost all of the local harvest was processed here, thanks to the hard work of Luigi Vitelli’s sons, Arturo and Giuseppe. High import duties of the United States, a consequence of the economic crisis of 1929, came as a hard blow for the Vitelli brothers. They decided to conquer new markets. Thanks to the high quality of their products, they were able to effectively expand their Italian distribution network. Large quantities of canned goods were exported to Africa and various European countries, including Belgium. In June 1945, “LUIGI VITELLI & sons” was renamed ELVEA s.p.A, an acronym for Luigi Vitelli Angri. It was after the war that the transport company L. Ghemar started distributing and transporting ELVEA tomatoes in Belgium. This success allowed the company to grow and to establish several subsidiaries. One of them, located in Antwerp (Tocofru NV), became the exclusive distributor for the Benelux. After the death of Mr. A. Ghemar in 1982, the company initially pursued its activities under the direction of his wife who had the same commercial talent. But when she died in 1986, the company Tocofru NV was taken over by the company Charlier Brabo Group, a family business in full expansion that still manages the distribution of ELVEA products in Belgium today. Then the time came when consumers wanted to be able to quickly prepare natural, healthy and varied meals. ELVEA was quick to propose the ideal solution: ELVEA Cubetti. Various natural ingredients were added to the already famous tomato cubes to flavour them. This new ready-to-use and already seasoned product was there to meet contemporary consumer demands. Currently, ELVEA Cubetti are available in 7 different flavours: garlic, Italian herbs, bell peppers, basil, fresh vegetables, arrabbiata and puttanesca. What could be better to flavour your pasta, pizza, rice, poultry, fish or meat dishes? In the year 2010, ELVEA celebrated its 125th anniversary. Throughout the year, the brand launched a series of cool actions: ELVEA fans were invited to send a recipe based on the newest ELVEA product, the Polpa di pomodore. The 25 best recipes were compiled into a quality cookbook distributed free of charge to all ELVEA fans who entered the contest. Those who wished could then also get the cookbook through a savings action at the distribution outlets. The tomato brand didn’t stop innovating, and launched "Pizza a Casa" as the ideal base for a homemade pizza. The new product has since been a huge hit with pizza lovers, big and small alike. ELVEA once again celebrated with many cool consumer actions, novelties, but also a brand new website. In 2015, the ELVEA range featured around 40 different products. The result of constant innovation over the years. The 100% Italian brand is therefore unquestionably the "numero uno" in Belgium in the canned tomato category. The 130th anniversary of ELVEA was the perfect occasion to launch the Selezione del Maestro, a limited edition consisting of three superior tomato products with an even more intense and savoury taste. 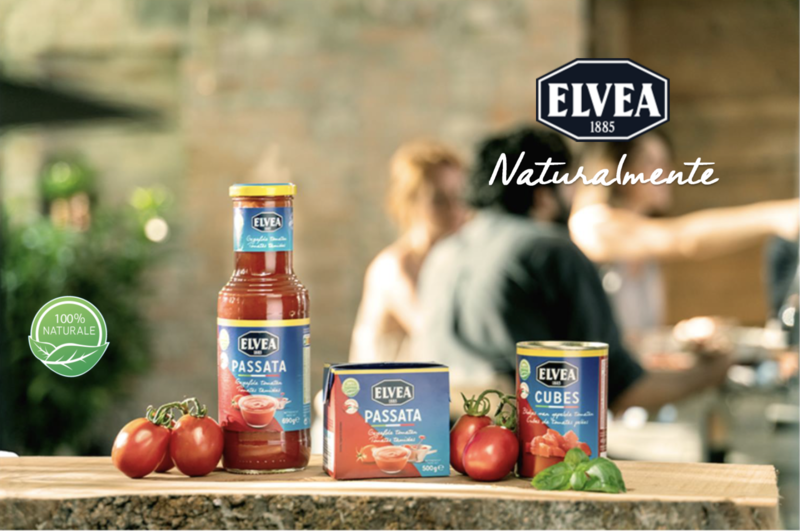 The tomatoes used were lovingly selected and picked under the Italian sun for the most loyal ELVEA fans. ELVEA closed out its 130th anniversary festivities in style! In December 2015, the brand opened an exclusive ELVEA Pop-Up Shop in Antwerp's communal party hall. For 3 months, this Boutique was featured in the middle of this splendid shopping mall. The entire existing ELVEA range was available, as was the exclusive ELVEA Selezione del maestro range. This limited-edition range was presented in a luxurious gift package. A brand new design for Elvea labels! Elvea, the market leader in the tomato category deemed that it was the right time to launch an innovative design. The new labels combined with the logo are striking. The characteristic colours, integrated into the label, bring more subtlety while photos of real products provide a livelier touch. The link with Italy is more obvious and there’s now a reference to our heritage and our tomato master Luigi Vitelli. Furthermore, the brand profiles itself more evenly than ever in the shelves. And did you know that the yellow line on top of our cans evokes the eternally bright Italian sun? Because it is precisely this southern Italian sun that gives your best tomatoes an irresistible full flavour. In 2018, the number 1 in tomato preserves wants to make sure that everyone ‘enjoys Italy’, which is also Elvea's new slogan.Elvea is really pulling out all the stops to make the new slogan known. So no less than Italian njam! TV chef Peppe Giacomazza will now be the ambassador of the tomato brand. But other TV chefs, such as Jeroen Meus and Sandra Bekkari, will be cooking with Elvea in 2018. The slogan will also be featured on trucks transporting Elvea tomatoes across Belgium, as well as on De Lijn, TEC & STIB / MIVB buses and subways, and on large posters along busy roads. Elvea will be 100% natural and 100% transparent in 2019. Starting on January 1, 2019, the brand will display a FreeFrom.iDcard that will indicate that all of its products are free of preservatives, artificial additives, colourings and GMOs (genetically modified ingredients). In addition, a Nutri-Score will also be assigned to the products. Are the ELVEA cans BPA-free? All our cans are free of Bisphenol A plastic. Are all ELVEA products 100% natural? All ELVEA products consist of 100% natural ingredients since 1885. No chemical components, such as colourings, flavourings or preservatives, are added. The only additives in the ELVEA products are of natural origin. Do ELVEA products contain fat? Do ELVEA products contain sugar? Some ELVEA products contain citric acid. What exactly is this? Citric acid occurs naturally in citrus fruits. It is a natural ingredient that is added to some ELVEA products to bring the acidity of the tomatoes to the correct level. If a product contains citric acid, you will find it in the ingredients list. Do ELVEA products contain salt? For any requests or information, just contact us using this this form.